Ms. Lady Anne Villanueva Alquizar, candidate no.9, 18 years old, 2nd year student of the University of St. La Salle taking up Bachelor of Science in Accountancy, and the 2nd child of Mr. and Mrs. Corazon and Luisito Alquizar, government employee of Bacolod City, was the La Carlota Pasalamat Festival Queen 2012. La Carlota City Mayor Juliet Marie D. Ferrer , Congressman Jeffrey P. Ferrer of the 4th District of Negros Occidental and Miss Alajar Sabanal , Pasalamat Festival Queen 2011 crowned Alquizar in a audience-packed Public Plaza of La Carlota Saturday. Alquizar received a trophy, sash, bouquet and cash prizes. She was also awarded as Miss Olive "C" and Miss Natasha Beauty. Special awards, sash, bouquet with special gift prizes. The first runner-up went to Miss Joy Magielyn Gasataya Jotilano, candidate no. 6, 17 years old, second year student of Colegio de San Agustin Bacolod taking up Bachelor of Science in Tourism of Barangay 8, Kabankalan City. She's the daughter of Mr. and Mrs. Daisy and Hilario Jotilano, a seaman and a housewife. She received a trophy, sash, bouquet, and cash prizes from Vice Mayor David T.Baga Jr., Mrs. Dorle Baga and Empress Schuck, actress of ABS-CBN Kapamilya Star Magic. She was awarded as Miss Photogenic, Miss To Go Traveland Miss "U" Placenta with special awards, sash, bouquet and special gift prizes. And the second runner-up was Miss Tiffany Hoope Magad, candidate no. 16, 19 years old, 3rd year student of the University of St. La Salle taking up Bachelor of Science in Hospitality Management and a native of Barangay San Juan, Municipality of Pontevedra, Negros Occidental. She's daughter of Mrs. and Mrs. Eulalia and Ali Magad, a court stenographer and member of the AFP-Philippine Army. She received a trophy, sash, bouquet and cash prizes from SPM Luis Jalandoni III, Beverly Rosales, Outstanding Women in Culture and Arts and Alejandro Suarez, International Model World Pacific 2011. She was presented the Designer Award for Best in Festival Costume and received a trophy, sash, bouquet and cash prize. 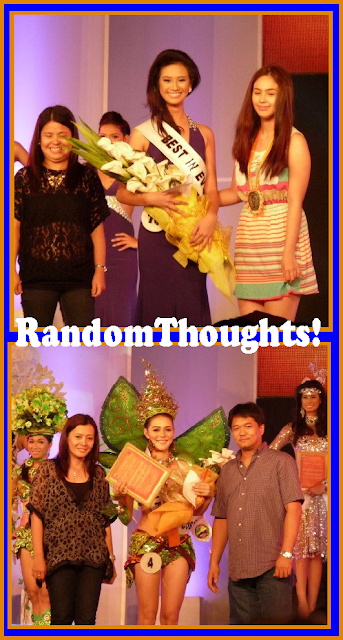 She also won as Miss Emperador Light awarded with sash, bouquet and special gift prizes. A. Miss Kathleen Montillano, candidate no. 10, Best in Evening Gown. She received cash prizes, trophy, sash and bouquet from SPM Karen Aguirre, and Empress Schuck. She was awarded as Miss High Fragrance, Miss Extract, Miss Natasha with special awards and special gift prizes. B. Miss Marivic Noble of Barangay Ayungon, candidate no. 5, Best in Talent. She received a trophy, sash , bouquet and cash prizes from SPM Jaime Mariño and Jake Galvez, a make-up artist. C. Miss Katrina Pearl Gomez, candidate no. 4, Best in Swimsuit and Best in Festival Costume. 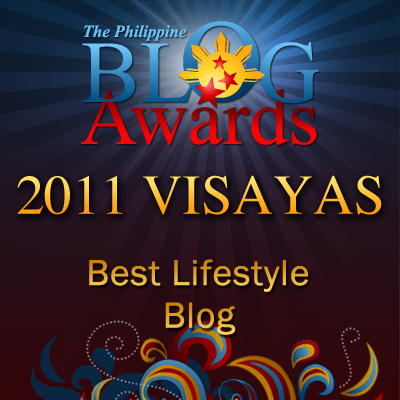 She received a trophy, sash, bouquet and cash prizes each category. D. Miss Katrina Javier Escolado, candidate no. 15, Miss Friendship. She received a trophy, sash, bouquet and cash prizes. 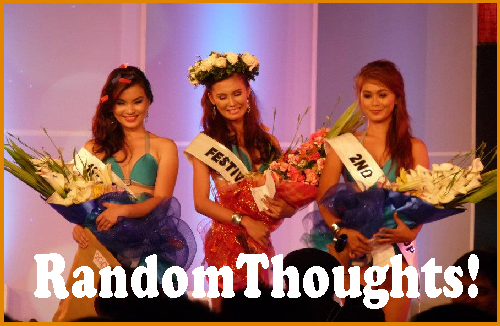 She was also awarded as Miss Pantene and Miss San Mig Light with sash, bouquet and special gift prizes. E. Miss Cherry Napatan, candidate no. 17, Miss Coke Light. She received sash, bouquet and special gift prizes. F. Miss Rye Rye Agapan, candidate no. 3, Miss Olay. She received a sash, bouquet and special cash gift prizes. G. Miss Pamela Lim San Agustin, candidate no. 2, Miss Skin White. She received a sash, bouquet and special gift prizes. The Board of Judges were composed of Beverly Rosales, Outstanding Women in Culture and Arts; JC Tiuseco, Kokak, Sisid, Poki Moon, Survivor Philippines; Ms. Empress Schuck-ABS CBN Star Magic Actress; Colin Alexander Kerr, Vice President Hotel Assn. of Manila; Alejandro Suarez, Interna-tional Model World Pacific 2011; Lauren Young, Mula Sa Puso Actress; and Jake Galvez, Make-up Artist. And the entire search was under the supervision of Madam Kitchie Benedicto-Paulino, Pasalamat Festival Executive Producer and Director. Anywhere in the Philippines...beauty pageants are taken seriously. Proud to be Pinoy with women who got the beauty and brains! This pageant is very refreshing to the eyes. The wreath as a crown makes the event even more appealing. Gil...what was ur role in this contest?